Growing up on the Nez Perce Reservation in Idaho, Loretta Tuell dreamed of becoming a lawyer from the time she was in second grade. Later, as a student at Washington State University, she received several generous law school scholarship offers. But UCLA School of Law was always a beacon. The renowned home of the nation’s leading Indian law faculty, starting with Monroe Price and Reid Chambers in the 1960s and 1970s, UCLA Law was, Tuell knew, where her career could really take off. But she didn’t understand the full benefits of becoming a Bruin until she arrived on campus in 1989 and met the professor who would become her mentor and friend, Carole Goldberg. Through clinical coursework and research projects, Tuell and her classmates regularly joined Goldberg on visits to tribes throughout California, including a memorable trip to the Pechanga Band of Luiseño Indians, where they engaged in legal efforts to ensure that local law enforcement respected tribal sovereignty. The excursions opened Tuell’s eyes to Native American affairs unlike those she had known back home in the Pacific Northwest. She learned about California’s more than 100 tribes and observed how lawyers impact tribal interactions with the federal government, tribes’ own internal governing structures, the repatriation of artifacts from museums to ancestral homelands, and everyday matters including education, health care and criminal justice. “Just seeing the different types of tribal homelands for me was a very important step in my potential leadership as a nationwide advocate for Indian country,” Tuell said. 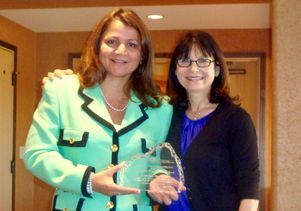 Loretta Tuell and her mentor Carole Goldberg. After graduation, Tuell became one of the elite lawyers in the field. She served as counsel on the U.S. Senate Committee on Indian Affairs and was a partner in major law firms engaged in the law and policy of native people. In 2009, she received the American Bar Association’s Margaret Brent Women Lawyers of Achievement Award, and she made sure to thank Goldberg first. Now the Jonathan D. Varat Distinguished Professor of Law Emerita after her retirement in June, Goldberg has stood at the summit of her profession for decades. She joined UCLA Law as one of its first female faculty members in 1972 and has served as associate dean of the law school, chair of the UCLA Academic Senate and UCLA vice chancellor for academic personnel. She currently chairs the Centennial Celebration Steering Committee, overseeing the year-long program that will mark UCLA’s 100th birthday next year. As a leading academic, she also founded and ran the university’s joint J.D./M.A. degree in American Indian Studies and the law school’s Native Nations Law and Policy Center. But to her, that record is secondary to her true accomplishment: propelling Tuell and dozens of students like her to represent Native Americans at the pinnacles of power across the country. The travels with students continue even as Goldberg nears retirement. Sarah Thompson, who is pursuing a J.D./M.A. and may be the very last student among the legion of Goldberg acolytes, bonded with her mentor on a recent trip to the Ho-Chunk Nation in Wisconsin. Thompson, who is scheduled to graduate in 2020, also credits Goldberg with helping her gain a spot as a summer associate with Sonosky, Chambers, Sachse, Endreson & Perry in Anchorage, Alaska. 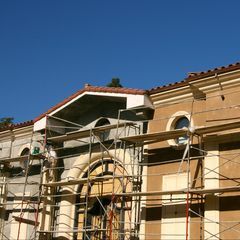 Founded by former UCLA Law professor Chambers, it is one of the nation’s premier firms representing Native American tribes. Other students point to the impact of Goldberg’s scholarship. Her 1975 UCLA Law Review article on Public Law 280, a statute central to the relationship between tribes and state governments, is a landmark. When the U.S. Supreme Court issued its unanimous 1976 decision in Bryan v. Itasca County, which prepared the ground for Native American tribes to operate casinos, the justices repeatedly cited Goldberg’s article. To this day, colleagues refer to her as the mother of tribal gaming, which has been the biggest boon to native peoples’ wealth, sovereignty and cultural identity in centuries. Goldberg also has worked with tribes from New Mexico to Maine and Alaska to Arizona to fine tune their internal laws and governments. 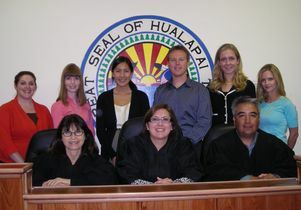 She is a justice on the Court of Appeals of the Hualapai Tribe in Arizona. She is a founding board member of the innovative Pine Ridge Girls’ School in South Dakota. She sits on the boards of directors of multiple non-profits that advance Native American rights. She was one of three people whom President Obama appointed to serve on the Indian Law and Order Commission, which Congress created to investigate and report on tribal community safety and justice. She has also written several books and co-authored Cohen’s “Handbook of Federal Indian Law,” the definitive treatise in the field. 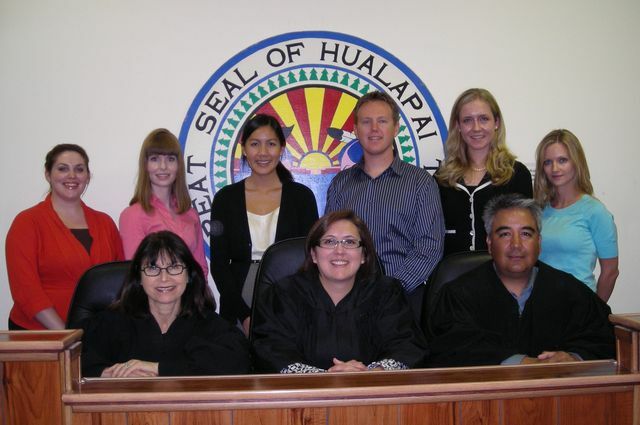 Carole Goldberg, bottom left, is chief justice of the court of appeals for the Hualapai Tribe in Arizona. In 2013, Goldberg won the Lawrence R. Baca Lifetime Achievement Award, the highest honor bestowed by the Indian law section of the Federal Bar Association. “She’s an icon. She’s indefatigable. 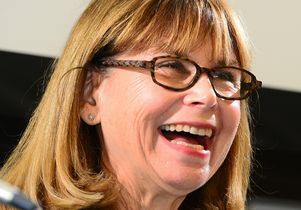 She’s an incredible mentor, and she’s all about building the pipeline, all about the future,” said UCLA Law professor Angela Riley, who nominated Goldberg for the honor. Riley succeeded Goldberg as the leader of the law school’s Indian law activities and recognizes the weight of carrying on her legacy. Recently, Goldberg and her husband, UCLA professor emeritus Duane Champagne, traversed 16 reservations across the country for a massive empirical study on criminal justice. It was unprecedented work for which she leaned heavily on students to conduct interviews and compile and analyze data. While Champagne hails from Ojibwe land in North Dakota, Goldberg is not Native American; she was raised in a tight-knight urban community, and her Chicago twang peppers her conversation to this day. “Advocacy on behalf of groups that were trying to resist forced assimilation, to sustain and revitalize their own cultures — as someone who had grown up in an observant Jewish household, I could relate to that impulse and I could support the endeavor very much,” Goldberg said. In February 2016, the UCLA Law Review hosted its annual symposium, “The Next Frontier in Federal Indian Law: Building on the Foundational Work of Carole E. Goldberg,” where the nation’s leading scholars and advocates hashed out ideas and reconnected with colleagues. Many attendees, of course, were former Goldberg students who have made a mark in Indian Law. They included Tuell; Rebecca Tsosie, who graduated from UCLA Law in 1990, is now at the University of Arizona’s James E. Rogers College of Law and coauthored the American Indian Law casebook with Goldberg and Riley. Attendees also included William Wood, who graduated from UCLA Law in 2006 and now teaches at Southwestern Law School and UCLA Law; and Addie Rolnick, a 2004 graduate, who is now at UNLV’s William S. Boyd School of Law. Through a day of panels and discussions, the participants debated the law, shared laughs with friends and collectively reminisced about the event’s main honoree, who helped each of them launch careers that have benefited Native people far from UCLA Law. Carole Goldberg, Jonathan D. Varat Distinguished Professor of Law Emerita at UCLA School of Law.